Win up to $100,000 for college with a Buick Achievers Scholarship; deadline is February 28! | Back to Basics Learning Dynamics, Inc. Win up to $100,000 for college with a Buick Achievers Scholarship; deadline is February 28! This scholarship is for high school seniors, high school graduates, and current post-secondary undergraduate students who plan to enroll full-time in an undergraduate program at an accredited four-year college or university in the United States or Puerto Rico for the entire upcoming academic year. To qualify for this scholarship, applicants must plan to major in a course of study that focuses on engineering/technology or select design- and business-related areas of study. Eligible majors include Automotive Technology, Chemical Engineering, Computer Engineering, Computer Science, Controls Engineering, Electrical Engineering, Energy Engineering, Engineering Technology, Environmental Engineering, Industrial Engineering, Information Technology, Manufacturing Engineering, Materials Engineering, Mechanical Engineering, Plastics/Polymer Engineering, Software Engineering, Graphic Design, Industrial Design, Product Design, Transportation Design, Accounting, Business Administration, Ergonomics, Finance, Industrial Hygiene, International Business, Labor & Industrial Relations, Management Information Systems, Marketing, Mathematics, Occupational Health & Safety, Production Management, Statistics, and Supply Chain/Logistics. Applicants must demonstrate an interest in pursuing a career in the automotive or related industries while using these areas of study. Applicants must be US citizens and have permanent residence in the United States. Scholarships will be awarded based on academic achievement; financial need; and participation and leadership in community and school activities, work experience, and interest in pursuing a career in the automotive or related industry. Special consideration will be given to first-generation college students, women, minorities, and military veterans or dependents of military personnel. 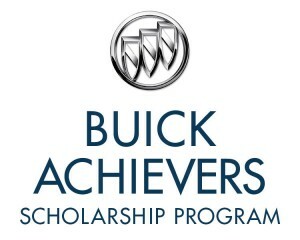 For more information, please visit Buick Achievers Scholarship. High School Juniors: Apply now for a $10,000 Nordstrom Scholarship! Buick Achievers Scholarship deadline is February 28; Winners receive up to $100,000 toward college tuition! $30,000 Doodle 4 Google Scholarship is now open; Deadline is March 20th!